Our holiday flat offers you holiday fun in a magnificent and untouched nature. Let yourself be whisked away to an adorable world and use the wonderful landscape for long walking tours, bicycle tours and promenades. Enjoy one of the most beautiful and most fascinating landscapes of Germany. Allow yourself an untroubled time for many small sensations far away from flippancy and replaceability. Our holiday flat is appointed high class and comfortable. Here in holiday you can feel yourself at home. We look forward to your visit! Of course we are at any time gladly available for any questions or reservations. For a short time you can find the new built Rhein-Neckar-Arena of TSG-Hoffenheim near by. More information’s and pictures you will find at our homepage www.ferien-im-kraichgau-de (numerous destinations) !!! After prior consultation and availability you can use a hobby and party room in the basement. This room is about 40 m² and has lots of possibilities to sit. Also you can find a ping pong table, an electric dart and a table top footbal game for free using. In the garden is a swing for the little ones and also a big trampoline (diameter 360 cm) for using. Eine sehr komfortable Wohnung, bei deren Einrichtung an alles gedacht würde. Wir haben uns mit unseren zwei Vierbeinern sehr wohl gefühlt und werden gewiss gerne wiederkommen. Ein herzliches Dankeschön der freundlichen Familie Brandt. Unseren Mitarbeitern hat die Ferienwohnung sehr gut gefallen. Die Vermieter sind sehr nett und die Kommunikation ist unkompliziert. Wir kommen gerne wieder. Die Ferienwohnung war super. Wir waren dort zu einem Kurzurlaub (3 Erw. und zwei Hunde). Die Wohnung ist gemütlich und liebevoll eingerichtet, man findet alles was man braucht. Gern kommen wir wieder. Die Wohnung ist einfach nur schön. Die Vermieter sind super nett man kann sich hier einfach nur wohlfühlen. 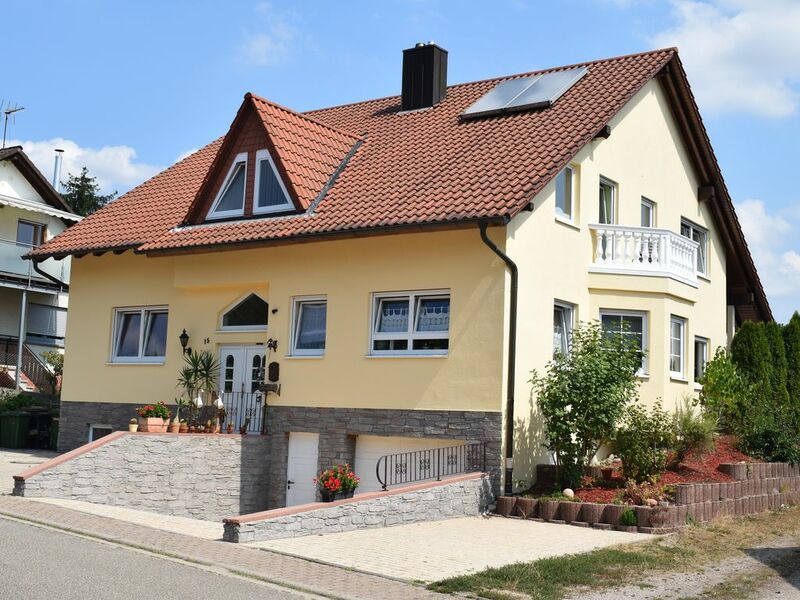 Our residence living of kind of realm lies in the junction region of the hill landscape of the Kraichgaus and the low mountain range of the Odenwaldes, in the small Odenwald so called, in the north of Baden-Wuerttemberg. Realm-kind-live were an administrative unit subordinated starting from the Middle Ages existing and to the cure-Palatinate upper office Heidelberg and an imperial court district, which covered into for instance the area of the small Odenwalds so called up to its southwest part and which seat of its Zentgerichts in living of kind of realm had. The Kraichgau is considered as one of the oldest cultural areas of Europe. In direct proximity (municipality wall) 1907 a lower jaw were discovered, which moves forwards over one half million years here living person forward oldest European, the Homo could be assigned heidelbergensis. Excursion tips (only a small selection): Heidelberg lock old part of town zoo, Sinsheim (museum & stadium), monastery Maulbronn, castle etc. Golf: In direct proximity are 2 golf courses. Im Preis enthalten sind Bettwäsche, Handtücher, sämtliche Nebenkosten (Strom, Wasser, Heizung, Müllabfuhr) sowie Prospekte und Beratung. Bei längerfristigen Buchungen gewähren wir Sonderpreise. Sprechen Sie uns an.